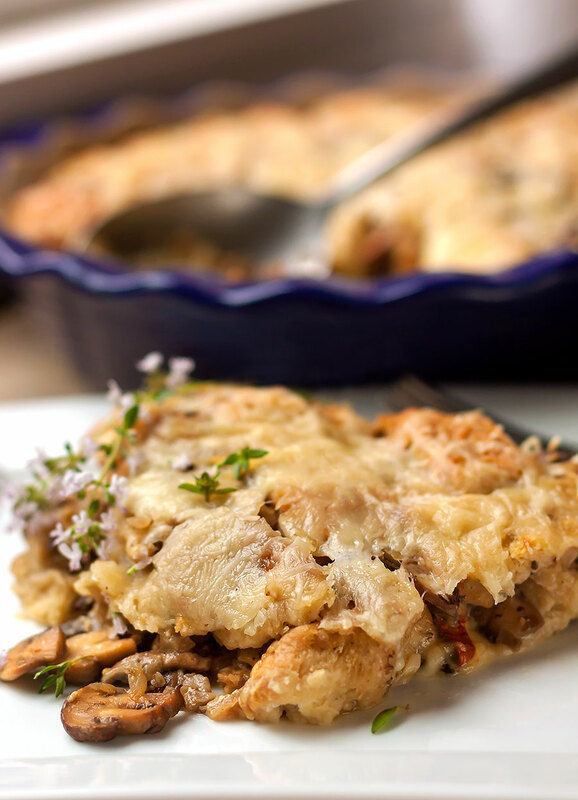 Twice the Flavor with Savory Double Mushroom and Cheese Strata! What’s a “strata?” Think savory bread pudding, only better. It’s an easy make-ahead meal that can be prepared the night before and baked just before you’re ready to serve it. While Double Mushroom & Cheese Strata is the perfect centerpiece for a lazy weekend brunch, it’s substantial and satisfying enough for a weeknight dinner too. Featuring savory cheeses, eggs and both fresh and dried mushrooms, this is rib-sticking comfort food at it’s finest – and a guaranteed hit with the entire family. We’ve doubled down on savory mushroom flavor with a combination of fresh and dried mushrooms. Using both in a single dish is nothing new; it’s a method frequently used by professional and savvy amateur cooks to add an extra depth of hearty mushroom richness to many dishes. Fresh mushrooms, whether wild or cultivated, provide flavor, texture and satisfying ‘mouthfeel,’ but it’s the dried mushrooms with their concentrated umami-rich taste that make the difference. When mushrooms are preserved by drying, their natural flavors are not only concentrated and intensified, they’re also subtly transformed into something just a little different, a little more earthy and wild-tasting. 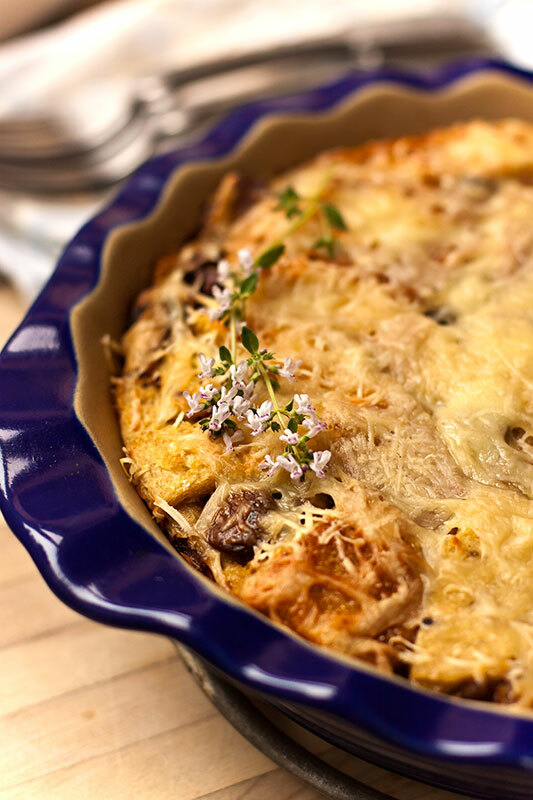 Our double mushroom strata combines many of the classic elements of a hearty country breakfast – eggs, milk, bread and cheese – but it’s easy to add or change ingredients around to suit the contents of your pantry or your appetite. Place the dried mushrooms in a small bowl and cover with hot water (about 2 cups). 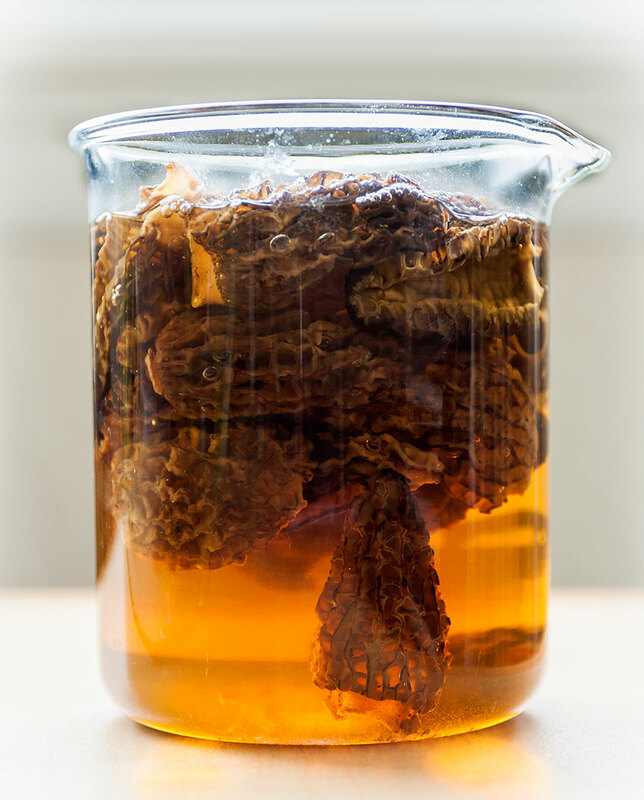 Allow to stand until the mushrooms are pliable and fully rehydrated, about 30 minutes. Strain, reserving the soaking liquid. Rinse the rehydrated mushrooms under cool running water for a few seconds, then drain again, gently squeezing to remove most of the liquid. Turn onto a cutting board, chop coarsely and set aside. Lightly oil a 13 x 9 inch baking dish. Heat 2 tablespoons olive oil in a large pan over medium-high heat. Add the onion and cook for 2-3 minutes. Add the sliced fresh mushrooms and reconstituted dried mushrooms and continue to cook, stirring frequently, for another 5 minutes. Stir in the thyme and garlic and season with salt and pepper. Remove from the heat, allow to cool slightly and place in a large bowl. Pour the dry sherry and 1 cup of the reserved mushroom liquid into the same pan used to cook the mushrooms. Bring to a boil and cook until reduced by half. Remove from heat. Whisk the milk and eggs together in a bowl until thoroughly blended. Stir in the sherry-mushroom liquid and season with salt and pepper. Arrange 6 slices of bread on the bottom of the oiled baking dish. Top with the mushroom mixture, half of the Gruyère, and half of the Parmesan cheese. Top with the remaining bread slices. Pour the egg mixture over the top and press gently to make sure that the bread is entirely saturated. Cover place in the refrigerator for at least one hour. Preheat the oven to 350°F. Top with the remaining Gruyère and Parmesan cheese and bake uncovered until the top is golden brown, about 40 minutes. Serve hot.